Running cords and air hoses all over a roof is not only a pain, but they also create a bunch of potential tripping hazards. 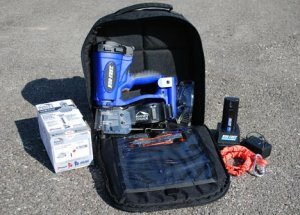 So when Duo-Fast announced the first ever cordless fuel roofing nailer back in 2010, you could see that is was going to be a popular tool. In the price range of $500, the Duo-Fast cordless roofing nailer is not in everyone’s budget, but if you fill out a short survey, you will be entered for a chance to win one. The giveaway ends on January 1st, so if you are at all interested, you better enter now, lest you forget. Head on over to the Duo-Fast website and click on the contest entry link on the left side of the page.